Weight Based Shipping is a simple yet flexible shipping method for WooCommerce focused mainly on cart weight (but not limited to) to calculate shipping cost. Plugin allows you to add multiple rules based on varying conditions. 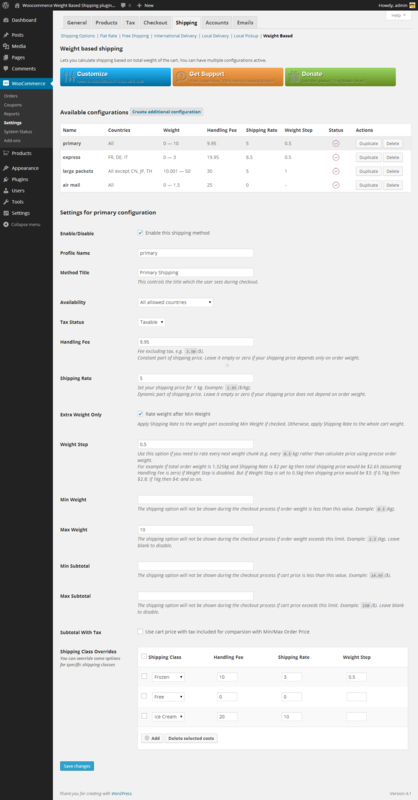 Multiple Rules You can create as many handling profiles as you need for different customer countries, cart weight and subtotal ranges. Â Flexible Price Calculation Each profile can be configured to expose a constant price (like Flat Rate) or a progressive price based on cart weight, or both. Shipping Classes For each shipping class you have you can override the way shipping price is calculated for it.